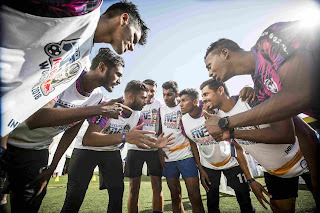 India, 23rd July 2018: Neymar Jr took to the field for the first time this season as the two strongest five-a-side football teams in the world were crowned at the Neymar Jr’s Five World Final in Praia Grande, Brazil. After 178 matches and 589 goals, Mexico (Mixed) and Brazil (Female) came out on top at the Instituto Projeto Neymar Jr in the neighbourhood where the Brazilian grew up. Neymar Jr’s Five is the largest five-a-side football tournament in the world, organised by energy drink giant Red Bull. Over 125,000 players signed up for a qualifier in this year's competition as elite five-a-side players battled it out in 62 countries across six continents. Mexico won all nine games they played, including a 5-2 win over Argentina in the final, to land the title in the mixed competition. The honour of being the first ever female world champions went to the home nation Brazil, who went unbeaten throughout the tournament and narrowly overcame Italy 1-0 in a final which had to be settled by a 1v1 ‘golden goal’. Both world champion teams will get an exclusive behind the scenes trip to visit Neymar Jr at Paris Saint-Germain. Deportivo Mago (Mexico) and Resenha 013 (Brazil) join Tao United from Romania (2017) and Anjos Da Bola from Brazil (2016) as winners of the prestigious tournament, organised by Red Bull. Neymar Jr watched the semi-finals and finals from the stands with friends and family, before stepping onto the field with his own special team to face the world champions in two memorable matches. A little over a week since his season ended in Russia, the Paris Saint-Germain star laced up his boots once again to score his first goals of the new campaign. Close friend, fellow Brazilian, and PSG teammate Dani Alves also joined Neymar Jr in attending the event as he continues his recovery from a knee injury. Friendly match 2 - Neymar Jr´s Five vs. women’s world champions (Brazil): https://www.redbullcontentpool.com/international/AP-1WBPY8YEH1W11. The location of the World Final, Instituto Projeto Neymar Jr, is a private, non-profit association dedicated to social causes, set up by Neymar Jr and his family. It is located in Jardim Glória, in Praia Grande, where Neymar Jr spent much of his childhood. The Institute is an 8,400m2 education and sporting complex catering for 2,470 underprivileged children aged 7-14 and their families. Follow Neymar Jr's Five on Facebook (facebook.com/neymarjrsfive), Instagram (instagram.com/neymarjrsfive) and via the website (www.neymarjrsfive.com).